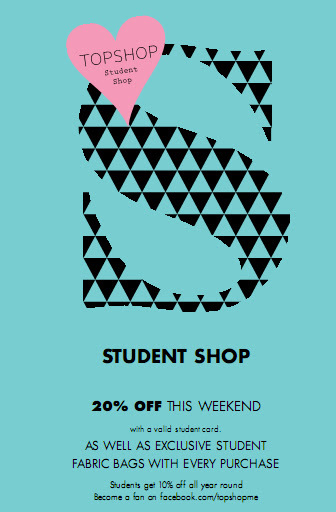 For Students Only 20% Off this Weekend ! Topshop/Topman are holding an exciting Student Weekend event from Nov 10-13th at their Avenues store where all university students get 20% off their purchase and Topshop/Topman customers get a an exclusive student shopper bag while supplies last!! All they’d have to do to avail from this offer is show a valid student ID card!